We are having a busy week at Independent Vision. We are preparing for the Wiltshire Sight Exhibition, at the Corn Exchange in Devizes. The exhibition is on the 12th September 2018 and you are all invited. We have printed brochures, folded leaflets and purchased new banners. Because of the exhibition, the aim of all this activity is to provide you, our customers, with the independent information needed to make the right decisions. 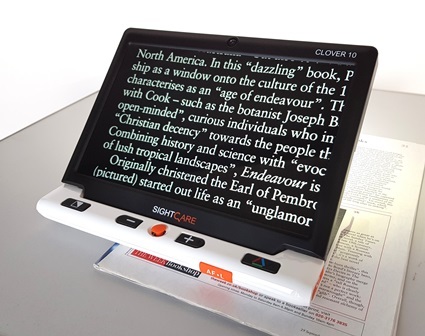 Therefore we will have on display a range of electronic table top and hand held magnifiers. As a result you will have the opportunity to try out some of the equipment. This will give an understanding of the equipment that may be suitable for you. If you decide that you want more information we will come to your home to discuss things with you. We offer a two week free trial on all equipment giving you the time to decide if it is right for you. Of course if you can’t make the exhibition all you need to do is call us on 01747 863406. We will always do our best to help. This entry was posted on Tuesday, September 4th, 2018 at 11:25 am	and is filed under Events. You can follow any responses to this entry through the RSS 2.0 feed. Both comments and pings are currently closed.